PHILADELPHIA, PA – October 10, 2018 – Janney Montgomery Scott LLC (“Janney”), a leading full-service wealth management, financial services, and investment banking firm headquartered in Philadelphia, PA, announced that the firm has been named to Barron’s 2018 list of Top 40 Wealth Management Firms. 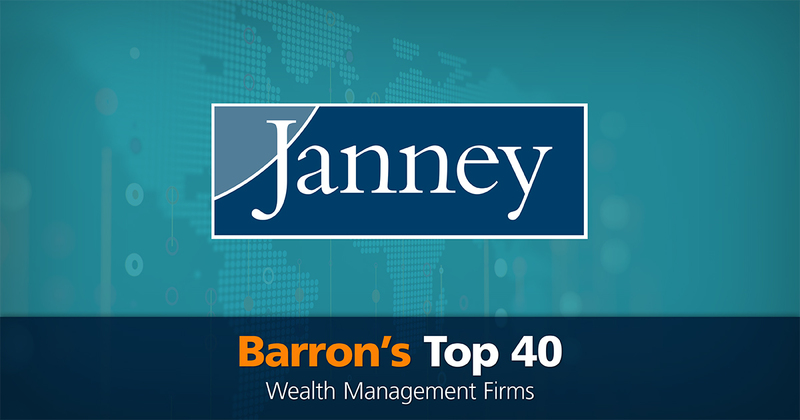 Janney increased its ranking from #34 in 2017 to #33 in 2018. Janney consistently earned recognition on this prestigious list since 2011. The 2018 ranking, published in the latest edition of Barron’s quarterly PENTA publication to high net-worth investors, ranks Janney as one of America’s largest wealth management firms by assets under advisement in accounts of $5 million or more. Together, the Top 40 Wealth Management Firms manage nearly $8 trillion in assets for high net worth clients. Janney managed $21.6 billion in its private wealth accounts of $5 million or more in 2018, up from $19 billion in June of 2017. For the full article and list of Barron’s Top 40 Wealth Management Firms, visit: Barron’s PENTA website.